The Sikh Coalition alerted us today about t-shirts that were being sold on the popular website CafePress.com, which allows users to sell clothing and other items with custom designs. Users upload their designs to the website, and CafePress handles the printing of those designs on shirts and other products, the transaction, and the shipping. CafePress charges and retains from the user a base price on the products and the user adds in their own mark up on each sale. The lack of enforcement of their own policies around permissible designs has caused CafePress some embarrassment. 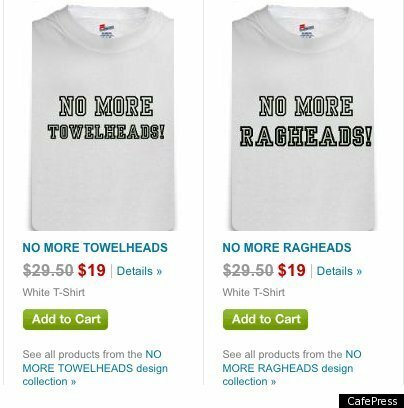 The shirts in question displayed slogans such as “NO MORE TOWELHEADS” and “NO MORE RAGHEADS”, which use slurs to speak of turbans in derogatory terms. Obviously, as the predominant community that wears turbans in this country, these shirts target members of the Sikh faith. Material that is generally offensive or in bad taste, as determined by CafePress. Clearly, these shirts violate this policy, and yet the t-shirts still appeared for sale on CafePress’ website. On discovering these products, the Sikh Coalition immediately created a petition to request that these shirts be removed and that CafePress improve its controls to ensure that such items are not permitted to be sold on their website again. When discussing this matter with non-Sikh colleagues, we began talking about freedom of speech. According to them, regardless of their content, I should agree that the sellers have the right to sell such products and that I should defend that right in defense of freedom of speech. I don’t believe that freedom of speech is a legitimate defense of slander, promoting hatred or threatening of an ethnic group (which is what these shirts represented); indeed, it is the abuse of that freedom. In my view, a true defense of freedom of speech would require that we use that right to protest when free speech is abused, as in this case. In a civilized culture, freedom of speech goes hand-in-hand with responsible speech. CafePress has since removed these products from their website, but it would serve the company well to (1) make a public statement about this issue, and (2) make sure it doesn’t happen again. Kudos to the Sikh Coalition for taking quick action on this issue.